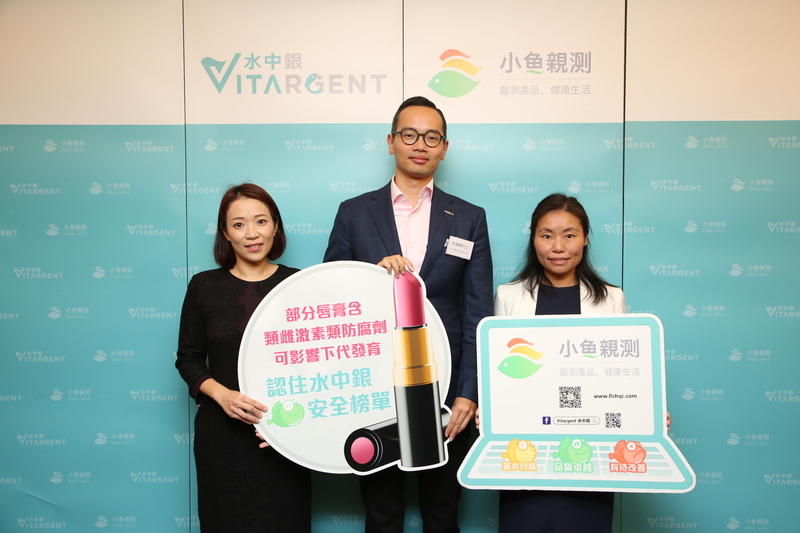 (Hong Kong, 14 December 2017) Vitargent (International) Biotechnology Limited (“Vitargent”) published test results of 31 popular lipstick products available in the market on its Test-it™ information platform (www.fishqc.com). Known for its safety examinations of cooking oil, BB cream, instant coffee, sunscreen, ice cream and milk, Vitargent has applied the “zebrafish” and “transgenic medaka” embryo toxicity testing technology, which is unique in the world and developed by Hong Kong scientists. The safety test rated 23 samples as Green Fish (excellent), 3 samples as Yellow Fish (basic) and 5 samples as Red Fish (sub-optimal). In the acute toxicity test, the most toxic European lipstick sample exceeds the safety standard by nearly 17 times as compared to products of the same category. This sample was also found to be highly toxic in the chronic toxicity test as it killed all fish embryos. Ingredients check suggested that nearly half of the samples contain various chemical preservatives. These estrogenic endocrine disruptors can be readily absorbed by the body and are discovered in breast milk, breast tissue, cord blood and placentae, impairing the health of the next generation. There are also products containing paraffin and fragrances which may irritate skins and even cause acute allergic cheilitis in serious cases. Consumers are recommended to pay attention to the ingredients and select lipsticks that offer basic functions and contain fewer additives when making purchases. A lipstick is a must-have item in a lady’s makeup bag. It is the secret of a woman’s impeccable look regardless of seasons and occasions. However, it is often that consumers only pay attention to the brand, colour, shining effect, scent and moisturizing features, instead of the chemical additives listed on the product label when choosing a lipstick. Since lipsticks are a necessity for women, we should be aware of the harmful chemicals inside to minimise the health risks due to prolonged and excessive exposure to toxicants. Between April and August 2017, Vitargent purchased a total of 31 lipstick samples under 24 brands, including renowned international names such as YVES SAINT LAURENT, L'Oréal, Shu Uemura, CHANEL, Maybelline, REVLON, Max Factor and Innisfree, from makeup counters, Watsons and online platforms (JD.com and Tmall.com) for fish embryo toxicity tests. According to the results of Test-it™, amongst the 31 lipsticks samples under the safety tests, 23 products are rated as Green Fish (Excellent), 3 products are rated as Yellow Fish (Basic) and 5 products are rated as Red Fish (Sub-optimal). In terms of price, amongst the 31 samples purchased, the average price is 62.3HKD/g, while the most expensive one costs 210.5HKD/g, which is over 9 times of the cheapest one that costs 22.9HKD/g. For the total of 12 samples that cost below 35HKD/g, 10 (83%) samples are rated as Green Fish; 1 (8%) sample is rated as Yellow Fish and 1 (8%) sample is rated as Red Fish. For the total of 9 samples that cost between 35HKD/g and 80HKD/g, 7 (78%) samples are rated as Green Fish and 2 (22%) samples are rated as Red Fish. For the total of 10 samples that cost above 80HKD/g, 6 (60%) samples are rated as Green Fish, 2 (20%) samples are rated as Yellow Fish and 2 (20%) samples are rated as Red Fish. In conclusion, low-priced lipsticks are safer than mid-and-high-priced ones. Over 80% of low-priced samples pass the safety test and are rated as Green Fish. On the other hand, 20% of mid-and-high-priced lipstick samples are rated as Red Fish. Consumers are advised to be extra cautious when selecting lipsticks. Lipsticks under the test mainly include Asian brands, European brands and American brands. All 6 samples (100%) of Asian brands from China, Japan and Korea pass the test and are rated as Green Fish. A total of 14 samples of European brands from France and Italy are selected, with 10 (71%) rated as Green Fish and 4 (29%) rated as Red Fish. For the 11 American brands from the USA, 7 (64%) samples are rated as Green Fish, 3 (27%) samples are rated as Yellow Fish and 1 (9%) sample is rated as Red Fish. Regarding product origins, the test selects lipsticks produced in China, Korea, Japan, Italy, Belgium, Ireland, France, Canada and the USA. Among the total of 31 samples, 11 samples were produced in Asia (China, Japan and Korea), with 10 (91%) rated as Green Fish and 1 (9%) rated as Red Fish; 16 samples were produced in Europe (France, Italy, Belgium and Ireland), with 11 (69%) rated as Green Fish, 2 (13%) rated as Yellow Fish and 3 (19%) rated as Red Fish; 4 samples were produced in America (the USA and Canada), with 2 (50%) rated as Green Fish, 1 (25%) rated as Yellow Fish and 1 (25%) rated as Red Fish. It is concluded that, in terms of brand origins, Asia performs better than Europe and America, as all samples of Asian brands are rated as Green Fish. The result is similar for product origin, where lipsticks produced in Asia are found to be safer than those produced in Europe and America. Vitargent’s Chief Executive Officer Jimmy Tao said, “Zebrafish embryo and transgenic medaka fish embryo were used in the acute and chronic toxicants tests on lipstick samples. There are 3 samples that failed the zebrafish embryo test for acute toxicants. As 84% of genes known to be associated with human diseases have a zebrafish counterpart, and the tissue and organs of zebrafish, such as their heart, bones, pancreas and kidney, are similar to those of human, many studies have proved that toxicants that affect the development of zebrafish embryos pose significant health threats to human. For example, they may cause cardiovascular diseases and abnormality in bone growth. It is worth mentioning that the development process of zebrafish embryos bears resemblances to that of human, and a day in zebrafish embryo development is 12 weeks (three months) in the development of human foetus. Our team observed under the microscope that, when zebrafish embryos were exposed to acute toxicants in lipstick samples, they developed abnormally and suffered from blood clotting disorders, heart swelling or even death in the most serious cases. Even though studies are yet to prove that certain diseases are underlying, the correlation with human is enough to draw attention to the potential health risk of acute toxicity as a result of exposure to sub-standard products.” Jimmy Tao also commented that, the toxicity of the European lipstick sample with the highest acute toxicity exceeded the safety standard by around 17 times as compared to products of the same category in Vitargent’s bio-database. Five samples failed the transgenic medaka fish embryo testing for chronic toxicants. When chronic toxicants (estrogenic endocrine disruptors) are present in lipstick samples, the liver of the transgenic fish embryo emit green fluorescent light, of which the intensity can be used to quantify toxicants. The fish embryos may die immediately in the serious cases. Our team observed under the microscope that the above European sample also showed high toxicity in the chronic toxicity tests and killed all fish embryos. The WHO and UN have stated that estrogenic endocrine disruptors may induce cancers (breast cancer, testicular cancer and prostate cancer), reduce fertility, cause nervous system disorder and diabetes, among other health problems. Pregnant women may also pass the estrogenic endocrine disruptors absorbed by their bodies to their children. Scientific studies have proved that such substances can be found in breast milk, breast tissue, cord blood, and even the placentas. They may be absorbed through the brains, respiratory system, digestive system and skin of the foetus, leading to developmental anomaly, precocious puberty in children and obesity as well as other health issues. As Vitargent’s Chief Technology Officer and Registered Toxicologist in the UK and Europe Dr. Xueping Chen pointed out, based on the ingredient lists of lipstick samples, the team discovered that various chemical preservatives, such as the common butylated hydroxytoluene (BHT) (found in 12 samples) and paraben preservative (found in 2 samples) were present in 20 samples. Preservatives are the potential cause of skin allergy, hence the more lipstick applied, the itchier it may become. Many countries have tightened the rules on the use of paraben preservatives. For example, Denmark prohibited the use of paraben preservatives in children’s products in 2012 and became the first paraben-free country. EU’s rules on cosmetics EC 1223/20091 and China’s Safety and Technical Standards for Cosmetics3 banned 5 paraben preservatives, namely isopropylparaben, isobutylparaben, phenylparaben, benzylparaben and pentylparaben, from 2014 and 2015 respectively. Currently, propylparaben and methylparaben are the most commonly used paraben preservatives by manufacturers. Consumers are recommended to pay attention to the ingredient labels on products and make wise choices. Furthermore, the most widely used chemicals in lipstick samples include colourings (found in 31 samples), fragrances (found in 8 samples) and paraffin (found in 7 samples). Colourings, such as Blue No. 1 (CI 42090; found in 21 samples), lemon yellow (CI 19140; found in 20 samples), Red No.30 (CI 73360; found in 10 samples) are used to enhance colour. Yet, they may increase the risk of skin allergy or even pigmentation. Fragrances including geraniol, hydroxy citronellal, citronellol, linalool, benzyl alcohol and benzyl benzoate, are all known allergenic fragrances that improve aroma. Paraffins such as petroleum jelly, petrolatum and minerals oils, are cheap and common moisturizers. However, they are not effective in keeping skin hydrated. As lip skin is much tender, it is prone to skin allergy. Dr. Joey Jeung pointed out that lipsticks with minerals oils extracted from petroleum and ore are moisturizing. However, their particles are larger than skin pores and may cause clogging. In addition, if petroleum is not properly refined, toxic substances, such as heavy metals or organic carcinogens, may not be filtered out. As a result, they may be absorbed directly through skin, leading to acute allergic cheilitis in serious cases. Dr. Joey Jeung recommended consumers not to store cosmetics at high temperature and humidity. Places next to a lamp or inside the bathroom are best to avoid so as to prevent contact with germs which may accelerate deterioration. Makeup should be removed before going to sleep to minimize the harm of residual cosmetics to the lips. Also, applying coloured lipsticks after putting on a layer of lip balm as protective coating can relieve irritation to the lips. Consumers should try out new lipsticks on the back of their hands or inside of their forearms, where the skins are more sensitive, for around 30 minutes. If there is no allergic reaction or red spot, the lipstick is likely to be safe to use. Dr. Jeung also reminded that if there is an allergic reaction on or near the lips, such as itchiness, rash or inflammation, consumers should stop using the lipstick immediately. In case of allergic lips, they are recommended to choose the most simple and basic lipsticks with the fewest additives. Regulation (EC) No 1223/2009 of the European Parliament and of the council of 30 November 2009 on cosmetic products. Official Journal of the European Union. L 342/59. 22.12.2009. USFDA Summary of colour additives for use in the United States in foods, drugs, cosmetics, and medical devices; Prohibited & Restricted Ingredients. Safety and Technical Standards for Cosmetics (2015 revision). Standards for Cosmetics. Ministry of Health and Welfare Notification No. 331 of 2000. Science of Total Environment. 2013, 461-462, 214-221. SCCS/1459/11. Opinion on fragrance allergens in cosmetic products. European Union. 2011.